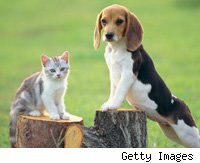 Earlier this year, Comedy Central's Stephen Colbert interviewed Jim Cramer about market psychology against a video background of puppies and kittens. Did it help the market rebound from its March lows? Who knows? But investors are sure feeling better about themselves. The Chicago Board Options Exchange's Volatility Index (VIX), the so-called "Fear Index," has fallen this year as stock prices have rallied. It dropped recently to 22.19, down from a record high of 80.86 in November 2008, though it remains above its 20.28 average over its 19-year history, according to Bloomberg News. The Dow Jones Industrial Average has jumped 27 percent over the past six months. According to The Wall Street Journal, "the VIX has been vulnerable to periodic spikes arising from external shocks. Subsequently, that same fear seems to dissipate and stocks resume their upward trend, perhaps indicating the market's resilience." There are already signs that consumers are acting more neurotic. Speaking on CNBC last week, J.C. Penney Inc. (JCP) CEO Mike Ullman observed that 60 percent of shoppers feel guilty after buying something they do not need. He said people want to simplify their lives. The importance of guilt in the economy is often overlooked. Why are we expected to spend $437.6 billion this year during the holiday season? Guilt. Of course, there is love involved as well, but guilt plays a strong role. There is a fine line between an expression of affection and one of remorse. Just ask any florist or jeweler. "It's one of many feelings that people have when they spend money," Dr. Mary Gresham, an Atlanta psychologist who studies the psychology of money, tells DailyFinance. Spending money gives people "a bit of a biochemical high." The funny thing about guilt, however, is that some people can learn to live with it. Bernard Madoff bilked some of his closest friends out of huge sums as part of the world's biggest Ponzi scheme. If the disgraced financier felt bad at all about his $65 billion con, he had a funny way of showing it. Somehow, he thought he was entitled to 17 Rolex watches and a 55-foot fishing boat called Bull. Americans got into our current financial mess because of our sense of entitlement. Can't afford a house? No problem thanks to exotic mortgages. Want a piece of chocolate? Go ahead. Nearly half of Americans eat chocolate at least a few times per week, according to a survey. According to the nonprofit magazine Consumer Reports, 33 percent of Americans carry credit card balances of up to $10,000. Another 13 percent owe more than $10,000 on their plastic. The remainder say that they pay off their balances every month. A separate survey by the Consumer Reports National Research Center found that one-third of people planning to shop on Black Friday are looking to buy gifts for themselves. Nothing is too good for people who think they are getting what they deserve. Unfortunately, that's the type of thinking that got us into our current economic mess in the first place.